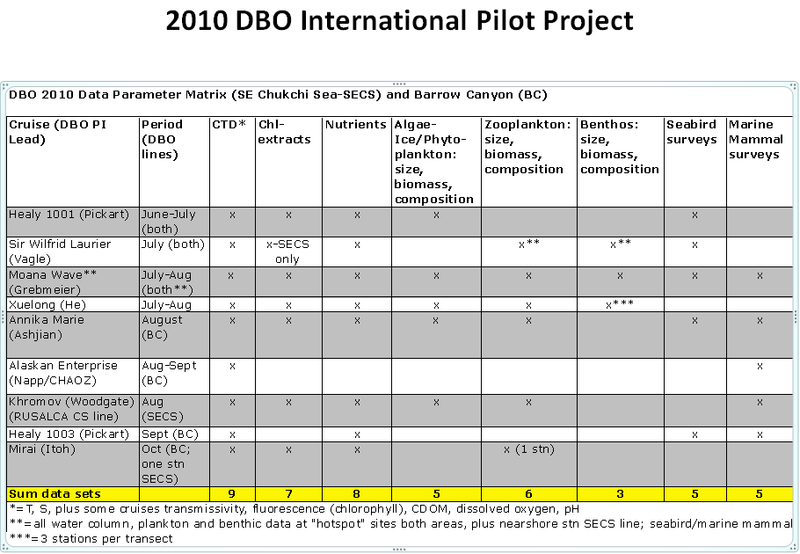 Matrix of data collections during the multiple international cruises at one or both of the DBO sites in a pilot mode. DBO 3 :SE Chukchi Sea Sir Wilfrid Laurier (July) vs RV Mirai (Sept) (above). 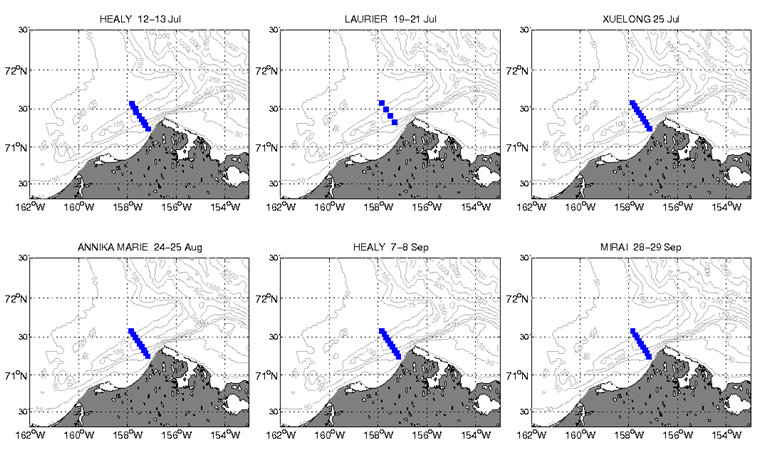 Over the season the Alaska Coastal Current (ACC) bringing warmer water to the system in the east. 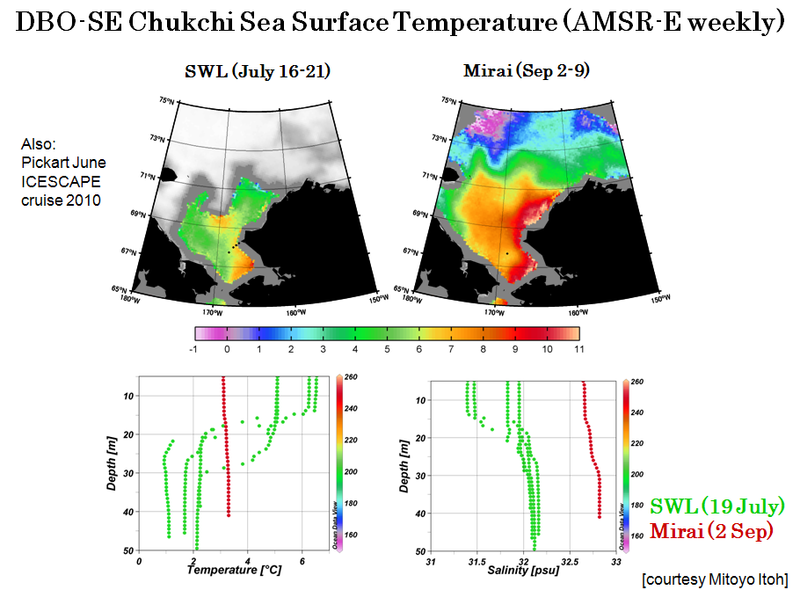 In the west warming Anadyr water results in warm Chukchi Sea summer water. 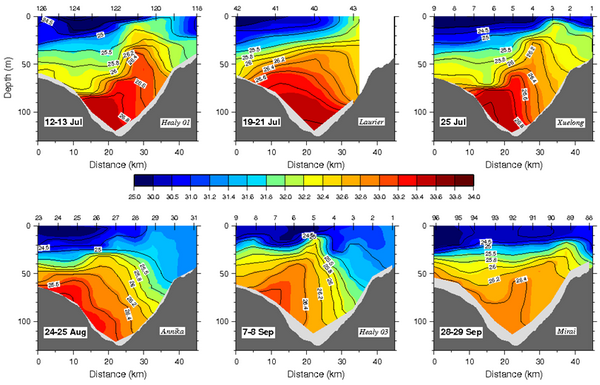 Within the lower panels we see the average stratification at about 20 m along the transect from west (left side of left panel) to the eastern coastal stations. 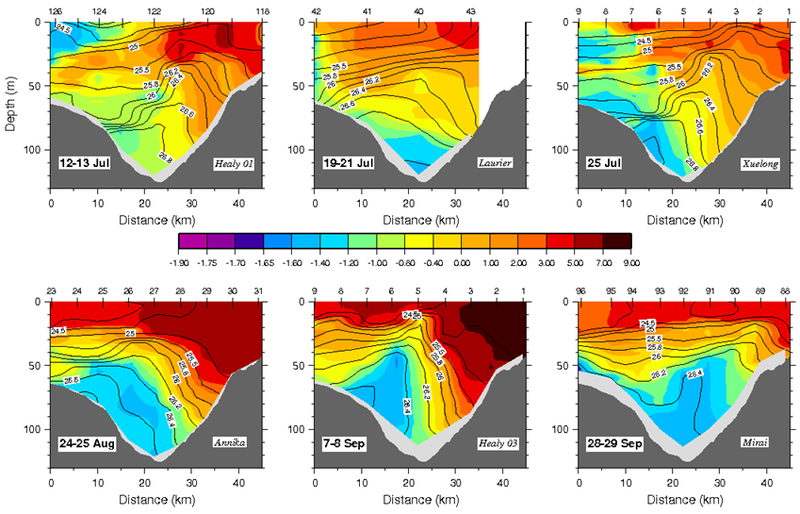 By comparison, the Sept. station is nearly vertical, indicating fall mixing, resulting in an average 3 deg C temperature throughout the water column, and much more saline water with the input of more saline Anadyr water northward in the SE Chukchi Sea. 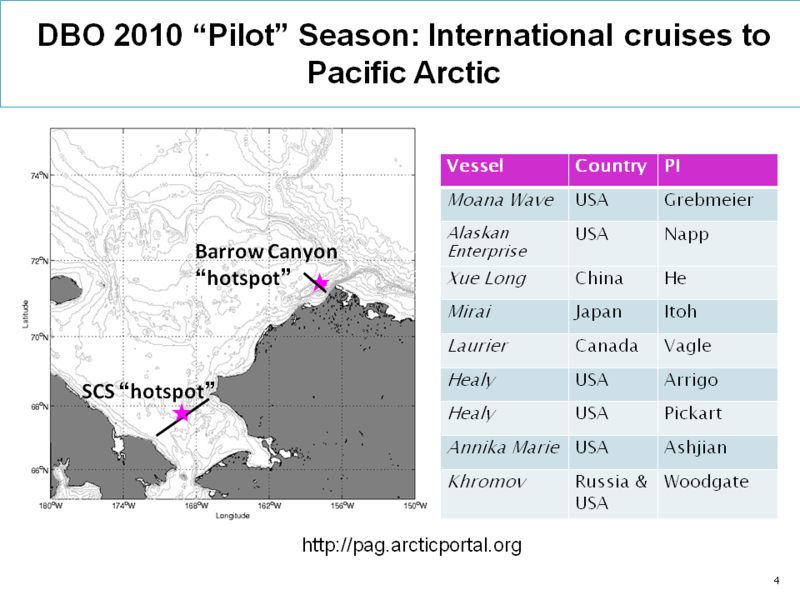 Note that two other cruises occupied this line (ICESCAPE and RUSALCA) and those data sets will be updated on this figure. 6 occupations of the DBO 4 (Barrow Canyon) line by 4 countries (above). (US, Canada, China and Japan) (above). Potential Temperature (C) in 2010 in Barrow Canyon (above). 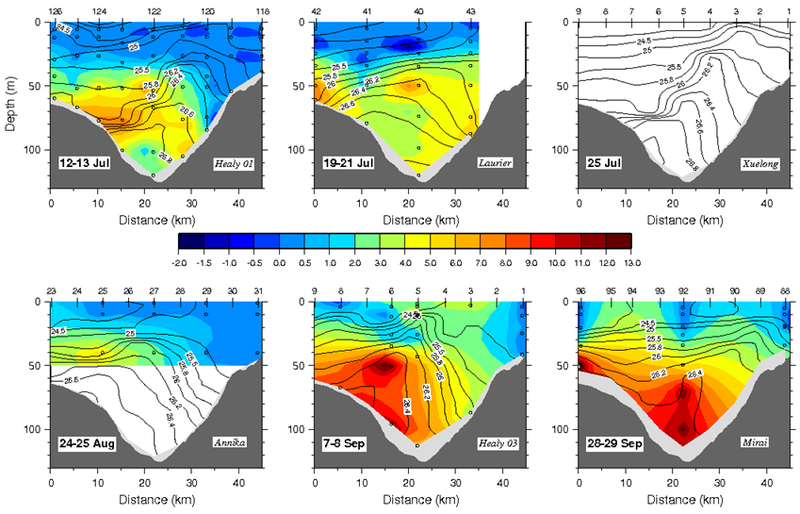 The Alaska Coastal Current is warmest along the Alaska coast in early September. Salinity in 2010 in Barrow Canyon (above). The Bering Sea winter water is saltiest early in the season, entering the canyon on the western side. Mean chlorophyll near Barrow Canyon in 2010 (above). 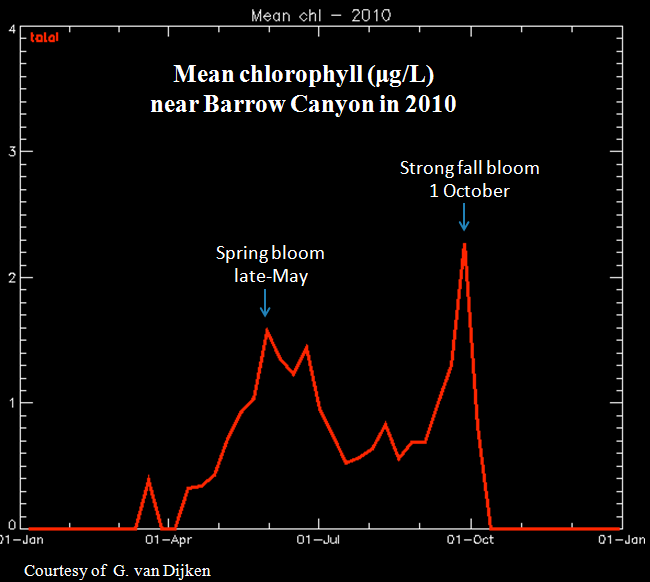 In upper Barrow Canyon, in 2010 spring bloom occurs in May (also see Hill et al. 2005 for earlier times series in this area). In recent years a later, stronger fall bloom is occurring in October.